On a Minnesota January Sunday Snowday, I don’t mind resigning myself to the kitchen for the day. Such is the case today. To lure the kids away from the constant call of electronics, we pulled out our Williams Sonoma The Cookbook for Kids recipe book on Saturday, put our list together and shopped. 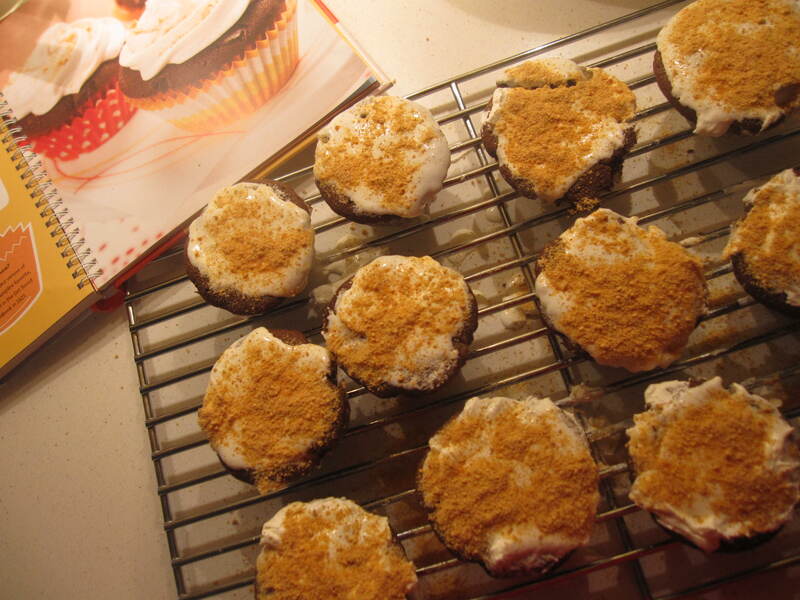 One recipe in particular looked so alluring sweets-wise, we all agreed we would make the S’more Cupcakes. Typically thought of as a campfire treat in the summer, I love the idea of making this winter s’more variation. I have always had issues with summer s’mores anyway. My kids think I’m fussy, but the three rectangles of Hersey’s chocolate, two large square graham crackers and one cylinder marshmallow proportions always seem messy and not quite right to me. I do have my own solution for this, but it’s complicated…. Mid-afternoon we dive into this recipe. My 7-year-old, Calvin, wanders into the kitchen lazily to help. He perks up at the spread of ingredients and all the mixing, egg-cracking and batter-licking it will require. My 9-year-old, Ava, is curious, but not enough to leave her favorite t.v. personalities… yet. Calvin and I get started by lining the cupcake papers in the muffin tin and completing Step 1 (see below). We’re already two messy bowls into the recipe. 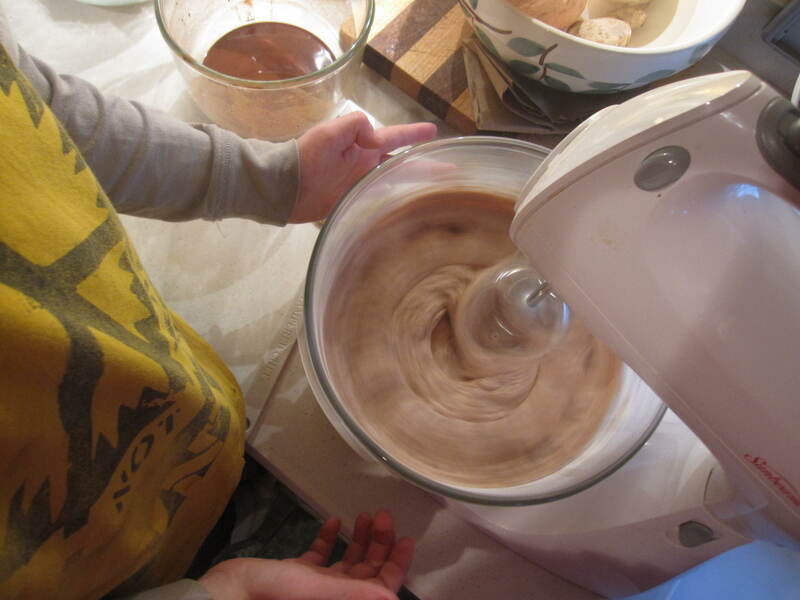 Moving onto Step 2 – the blending – I do the pouring in of ingredients and he lightly guides the mixing bowl as it whirls around. The most fun being the flour mixture as it produces poofy whiteness contrasted by the liquid cocoa/vanilla/buttery mix. We spoon the mixture into the 12 cupcake holders and have quite a bit left over which goes into a separate dish. Calvin then sprinkles the Ghirardelli Milk Chocolate Chips on top (the recipe calls for one-fourth cup/ 1.5 oz – we use about one-half of a 11.5 oz bag). In the oven they go. We wait impatiently – turning the oven light on and off. About 5 minutes out, we make the frosting which is seriously yummy. I’m not even a marshmallow fan and I like it. A lot. Probably because it’s more dense and creamy (versus fluffy) what with three-fourths cup of butter and a half cup of powdered sugar. We don’t even have to crush the graham crackers as the recipe directs (this would actually be fun for kids) because I just bought the graham cracker crumbs instead. The recipe calls for a slight amount and we triple that, but I do only go with half the frosting. The point is, we can be a little creative here, kids! Prematurely, I frost them before they’re cool enough (again, impatience!) and it makes for a mess typical of a summer s’more. If you make them – be sure to wait it out. As we taste and review, we all agree that we enjoy this variation on a s’more by our indoor fireplace very much. Delish! Preheat the oven to 350 degrees. Line a 12-cup muffin pan with paper liners. In a small bowl, combine the 1/2 cup unsweetened cocoa powder with 3/4 c very hot water. Stir until blended, then add the 1 1/2 teaspoons of vanilla. Set aside. In a medium bowl, stir together 1 1/4 c all-purpose flour, 1/2 teaspoon baking soda and 1/2 teaspoon salt. Set aside. In a large bowl, using an electric mixer, beat 3/4 c butter on medium until shiny (about 20 sec). Add 1 c granulated sugar and beat until light and fluffy (about 2 min). Add the two large eggs, one at a time, beating until just blended after each addition. Beat the flour mixture into the butter-sugar mixture in three batches, alternating with the cocoa mixture in two batches. In a large bowl, using an electric mixer on med speed, beat 1/2 c butter (room temp) until shiny and smooth (about 2 min). Add 1/2 c powdered sugar and beat until smooth. Beat in the marshmallow creme (one full 7oz jar, just as you buy in the store) until just blended. Spread the frosting on the cupcakes. Sprinkle the graham cracker crumbs over the top (if you’re using whole crackers, place them in a ziploc bag and crush two whole crackers with a rolling pin). Usually the school subjects my seven year-old son, Calvin, tends to be jazzed about are recess and lunch. Every day I get reports about how little time he actually gets to eat his lunch and play outside. One day last week, he came home thrilled about extra time devoted to one of his favorite subjects: food. The school had someone come in from Midwest Food Connection to make a recipe right there in their classroom for two days last week. I’m pretty sure Calvin was in the front row, taking in all the techniques and mixology that went into the recipes. 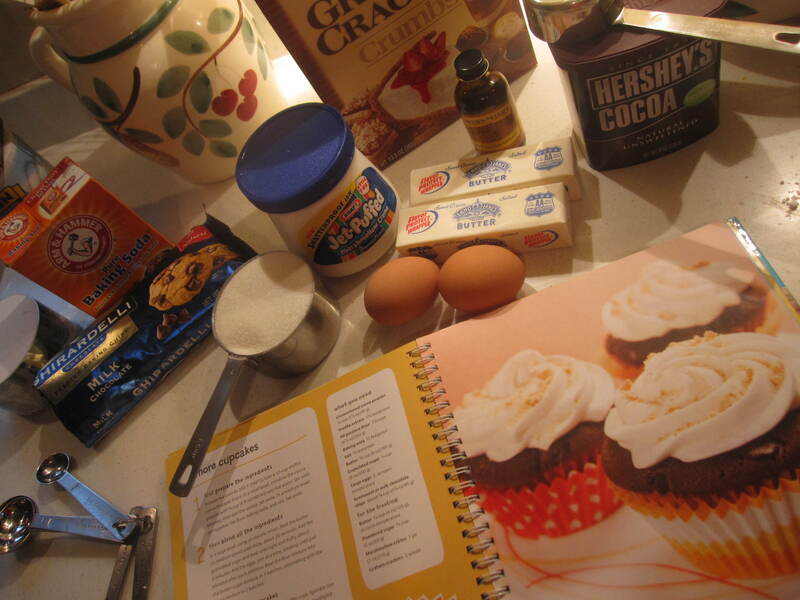 Upon picking him up at school last Tuesday, he waved the recipe card in my face: Mom, we have to make this stuff. It’s SO good! It was a recipe for salsa. Not rocket science and quite basic. His enthusiasm ensured the ingredients made it to my grocery list for Wednesday. With portions of a whole as the quantity in the original recipe, I increased everything accordingly so I could use the full ingredient. 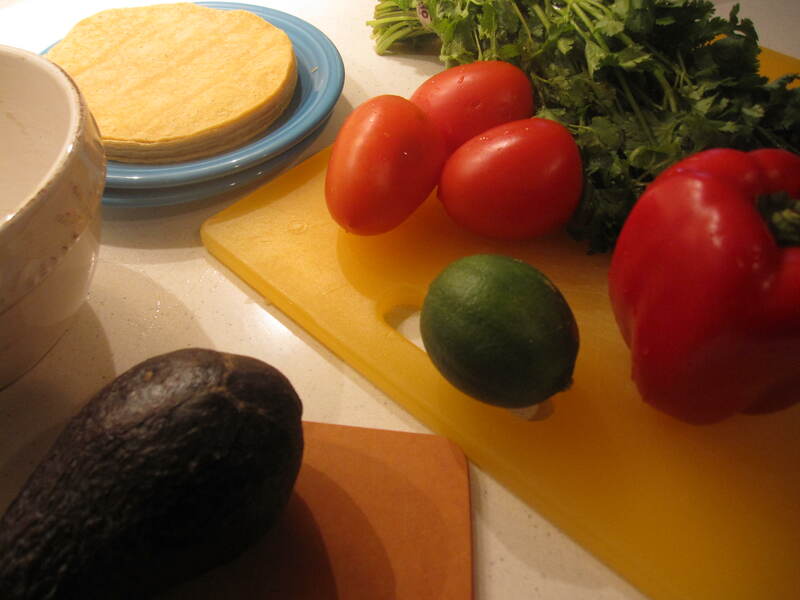 What do you do with half of an avocado, three-fourths of a bell pepper and 18 sprigs of cilantro? As he hopped out of the car at school drop-off on Thursday morning, he eyed me: We are going to make that salsa today, right? Me: Sure. True to form, after school, he reminded me once more. He stuck his head in the fridge, seeking our ingredients. After everything was assembled and awaiting chop, dice or squeeze techniques, we re-read the recipe and figured out what each of us would do. I am still not comfortable with him using a sharp knife – especially to dice items into small pieces, so I did all of the knife work. 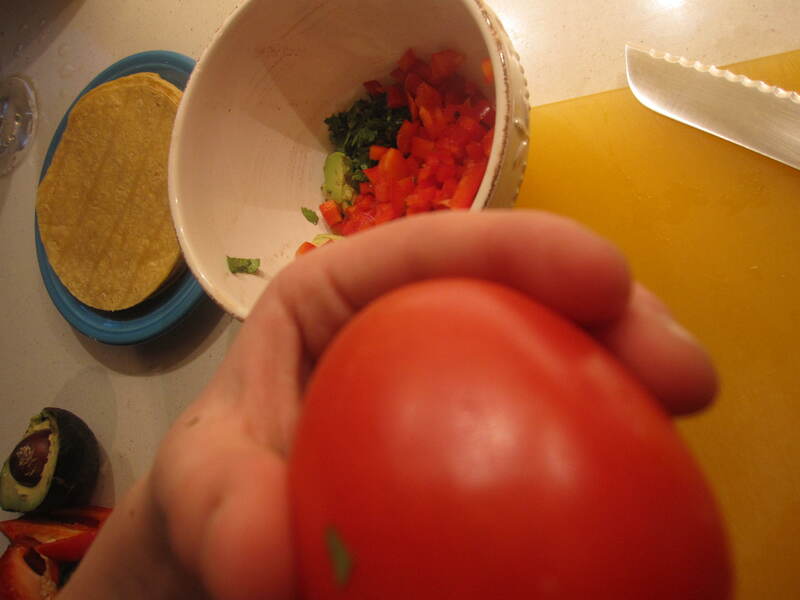 I also had him watch as I dismantled the seedy pepper, chopped the tomatoes and popped the pit out of the avocado. 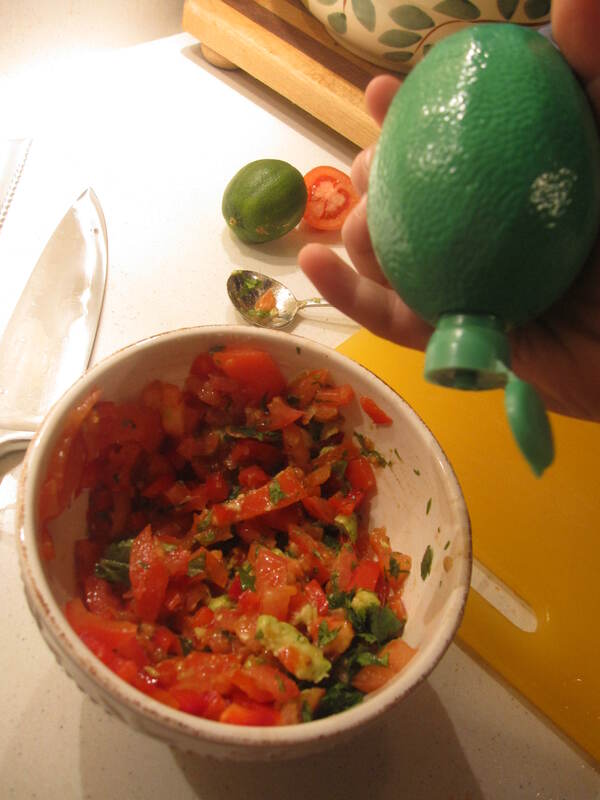 He washed veggies, de-leafed the cilantro, scooped out the avocado, squeezed the lime juice, added the salt and mixed everything together. Oh, and sampled to taste: Needs more salt. I heated up the corn tortillas on a pan on the stove and we spooned the salsa onto the tortillas. We sat at the table for a little lesson in wrapping. Typically, this would be a side dish to a main course, but at 3:00 in the afternoon, it was a perfect snack. I’ve made salsa many times in the past with similar ingredients including garlic, but never with bell pepper. I could have eaten this salsa like candy. Calvin agreed and we attribute the sweetness to the pepper, thus renaming it Candy Salsa. 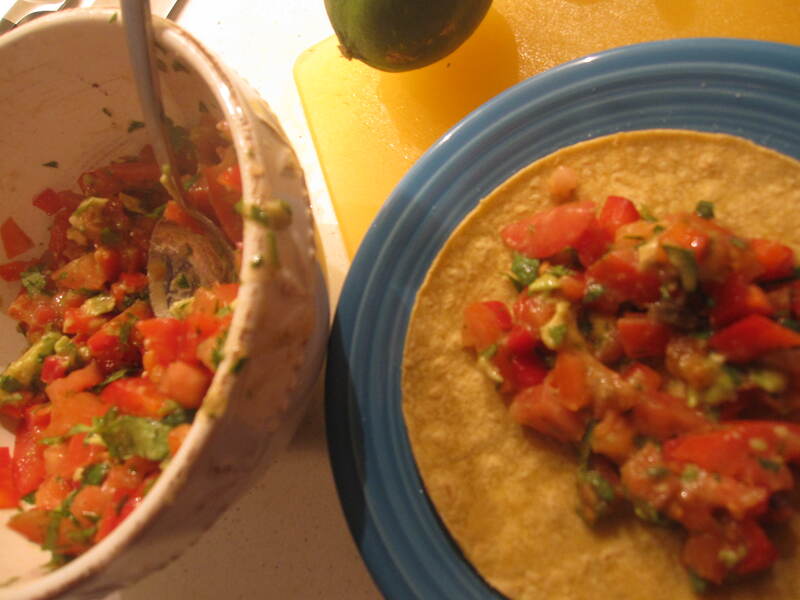 Mix together in bowl and serve on warm corn tortillas or with corn tortilla chips. Recipe from The Gift of Grain Lesson and presented by Midwest Food Connection at Hale school in Minneapolis the week of January 14 2013.